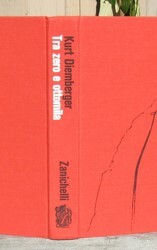 This is the first printing of the first edition of TRA ZERO E OTTOMILA by Kurt Diemberger. 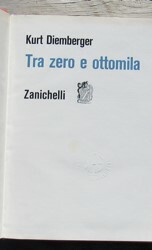 This book was published in Bologna by Zanichelli in 1970. The book measures 237mm tall x 185mm and has 428 pages, 119 b/w & 26 color photos (photos are numbered, but several are skipped in the numbering), 7 maps, chart, 1 sketch. The text is in Italian. This first Italian edition, published a year before the English edition, has 41 more b/w photos than are found in the English edition and has 26 color photos that are not included at all in the English edition. This Italian edition is in a slightly larger format than the English edition. 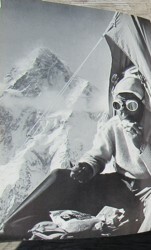 Included loosely in this book is an original postcard mailed from the 1960 expedition that made the first ascent of Dhaulagiri. 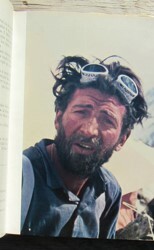 Diemberger was one of the summiters. The card has two Nepalese stamps with black cancel mark and a violet 1960 Dhaulagiri Expedition cachet. This card has been signed by Diemberger, Eiselin, Forrer, Hajdukiewicz, Schelbert, Diener, and by somebody using a local script. It also has a finger or thumb print intentionally inked onto the card -- probably by a summiting Sherpa or the sirdar. 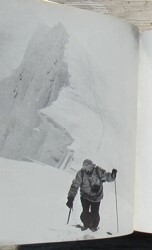 Diemberger, Forrer, Schelbert, and Diener reached the summit. CONDITION: Original red cloth, black illustration front, black & white lettering spine. paper DJ (no printing, just b/w photo of flutings on a peak), clear cellophane DJ with blue lettering front & spine that goes over the paper DJ. The book is in very good condition with no previous owner marks or writing on any pages, clean covers, no rubbing, solid binding, slight browning to top edge of the text block, minor foxing to first few and last few pages. There is a crimp mark on the title page (all examples of this book should have it) which I believe indicates that the book was produced with union labor. The clear plastic jacket is without tears or wear. 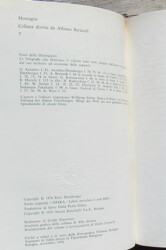 The paper dust jacket has some curling along the top edge with some very tiny chipping and two tiny 1mm to 2mm tears. The postcard has minor wear along the edges but is clean and without any crease marks. Price: $245.